1. Place ballBags mix, coconut yoghurt and desiccated coconut into a bowl and play mud pies. 2. 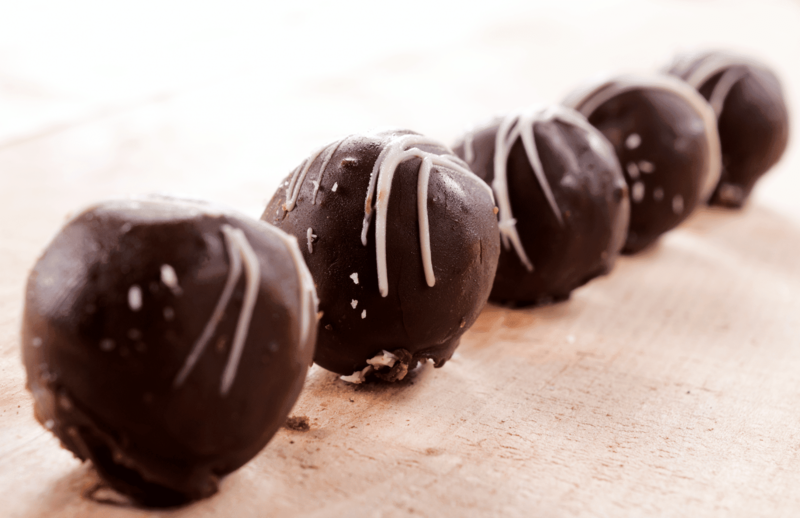 Roll mixture into balls- if the mixture is too soft add 1 tsp of coconut at a time until balls come together nicely. if mixture is too dry and falls apart add one level teaspoon of coconut yoghurt at a time until balls form nicely. 4. Fill a saucepan 1/4 of the way with water and bring to a boil over medium high heat. Reduce to simmer.Then set a medium glass or ceramic mixing bowl on top, making sure it’s not touching the water (this creates a “double boiler”). 5. Add finely chopped cocoa butter to the bowl and let melt – 2-3 minutes. 6. Once melted, add the maple syrup or agave nectar and use a whisk or wooden spoon to mix until fluid and thoroughly combined. Remove bowl from the saucepan and turn off the heat. 7. Add cacao, vanilla (optional), and sea salt (optional), and whisk to combine until there are no clumps. Thank you to Emma Boucher for this recipe!